Average credit card rates offered to consumers for new accounts rose slightly in the last two weeks, due to an increase in reward credit card rates, according to the latest survey by IndexCreditCards.com. Rates offered to consumers for reward credit cards jumped by more than a tenth of a percentage point to 17.43 % from 17.32 %. The rate for non-reward consumer credit cards stayed the same at 15.15 %, while the overall consumer credit card rate rose to 16.74 % from 16.67 %. 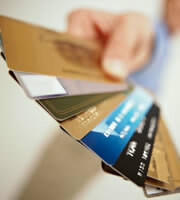 All other credit card rates remained level since the last survey by IndexCreditCards.com in early November. Reward credit card rates for both business owners and consumers are generally higher than rates for non-reward cards. Issuers charge higher interest rates to pay for the cash-back and other incentive programs for using the cards. One year ago, the average reward credit card rate for consumers was 17.09 %. Rates actually dipped below 17 % in early 2010, then rose to 17.39 % six months ago and peaked at 17.46 % in June. Rates bounced slightly up and down since then and dropped to 17.32 % in mid-November from 17.43 % in late October. Although business and student credit card rates remained level in the last two weeks, they are up from one year ago. The current average of 14.72 % is more than a full percentage point above the average business non-reward credit card rate of 13.39 % in early December 2009. The average business reward credit card rate is currently 16.21 %, versus last year's 14.53 %. The average student credit card rate now stands at 16.23 % compared to 15.91 % in December 2009. Overall rates offered to students for new accounts have remained more stable in the last year than rates for business owners and consumers. Under new federal credit card regulations that went into effect in February 2010, credit card issuers now are prohibited from marketing credit cards on college campuses and giving away free merchandise to students for filling out applications. Students must now get adult cosigners on accounts if they can't prove they have a steady income to pay their bills. Those regulations stemmed from the Credit CARD Act signed into law in May 2009 as a major overhaul of the credit card industry. That law did not address business credit cards, although some issuers have extended some of the consumer protections contained in the law to business customers. The IndexCreditCards.com survey takes into account all the rate tiers offered for credit cards. Issuers often charge two to four different rates for a single card, depending on the customer's credit rating. Those with excellent credit qualify for the lowest rates, while those with average to poor credit are offered higher rates. Multiple rate tiers for a single card vary by anywhere from 4 % to 12 percentage points among credit cards included in the survey. One consumer credit card, for instance, offers rates from 11.99 % for applicants with stellar credit to 23.99 % for customers with, let's say, more earthly credit. Multiple rate tiers are also used for many business and student credit cards. 0 Responses to "Average Credit Card Rates"